I know that we who are queer are always stronger than we think we are. We are resilient and determined. Our love is stronger than our enemies’ hate. I can bear witness that the moment a queer person can proudly say, “I am who I am, and I’m not going to be someone I’m not,” that person welds an eternal connection with the sacred name of the living God (Exodus 3:14). I can bear witness that the most modest hope of a queer person can thoroughly eviscerate the devil and render him powerless, as this disrupts his plan to make us miserable like unto himself. I can bear witness that the smallest tear that plops from the eye of a queer person will not reach the ground before being noticed by our Heavenly Parents, and all the angels of heaven, too. I can bear witness that queer people exist, not so that they might become straight, but that they might have joy (2 Nephi 2:25). I can bear witness that the Lord did not send me into this world only to forget about me. I can bear witness that there is more room for me in the plan of salvation than there is in the closet. I can bear witness that no one can blame their homophobia on the God who created me gay. I can bear witness that I would not have accepted the plan of salvation in premortality if there were not a place for me in it. I can bear witness that the only place for homophobia in the Church is in the Church History Museum. I can bear witness that a handful of people can change the world, and that’s exactly how the Lord has always worked in the world. I can bear witness that no matter what earthly experts do to me because I don’t fit into their building plan, I know that the stone that the builders rejected will become the chief cornerstone. (Psalm 118:22). I can bear witness, to those who think that we are in last place, that the first shall be last, and the last shall be first (Matthew 20:16). I can bear witness that I can never attack the leaders or members of Christ’s Church, because I have no weapons of pencil or pixel with which to attack. I am completely disarmed by Christ’s example on the cross. I have no weapons; I have nothing but the unarmed truth of my people and unconditional love for all people. And this will change everything. I can bear witness that this is my Church, too. I can bear witness that Satan screamed and cried the day I joined this Church, because he HATES to see gay people happy. I can bear witness that revelation is not an exact science, but requires an enormous amount of human input and readiness. I am patient with Church leaders and members, and my solemn expectation is that they will be patient with me. My patience is based on the fact that our prophetic gifts and our knowledge are limited, partial, and imperfect, and will be until the end of time. “Charity never faileth: but whether there be prophecies, they shall fail; whether there be tongues, they shall cease; whether there be knowledge, it shall vanish away. For we know in part, and we prophesy in part. But when that which is perfect is come, then that which is in part shall be done away.” (1 Corinthians 13:8–10). I can bear witness that we are all members of a diverse body (1 Corinthians 12). 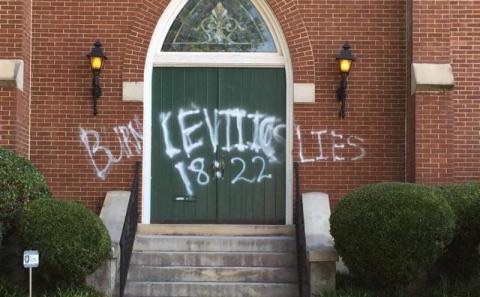 When a anyone attacks, condemns, or dehumanizes an LGBT member, it’s not “us vs. them,” it’s “us vs. us.” They are making the body of Christ engage in self-cannibalism. I can bear witness that the Church can change and will change and always is changing, as growth and development is the whole point of our mortal journey, and our Church is founded on the rock of revelation. I can bear witness that the Church is true. I can prove neither this truth nor my hope, but I do not need to. There is never enough proof, but there is always enough revelation. Somewhere I read that “all are alike unto God,” and I know that we will be ever more fully living into this truth, line upon line upon line. Let’s walk this journey together, hand in hand. The highest and noblest ordinance of the temple is the sealing of couples for eternity. 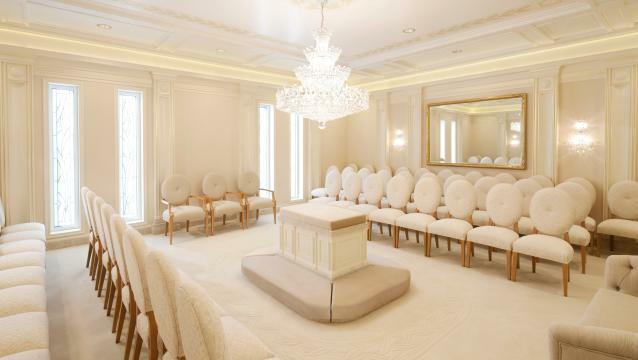 This ordinance, the culmination of the New and Everlasting Covenant, is performed in special rooms that are adorned with mirrors on the walls facing each other, reflecting and re-reflecting each other forever. This represents our conviction that the marriages consecrated therein are eternal, farther than the couple can see or imagine in the mirrors. 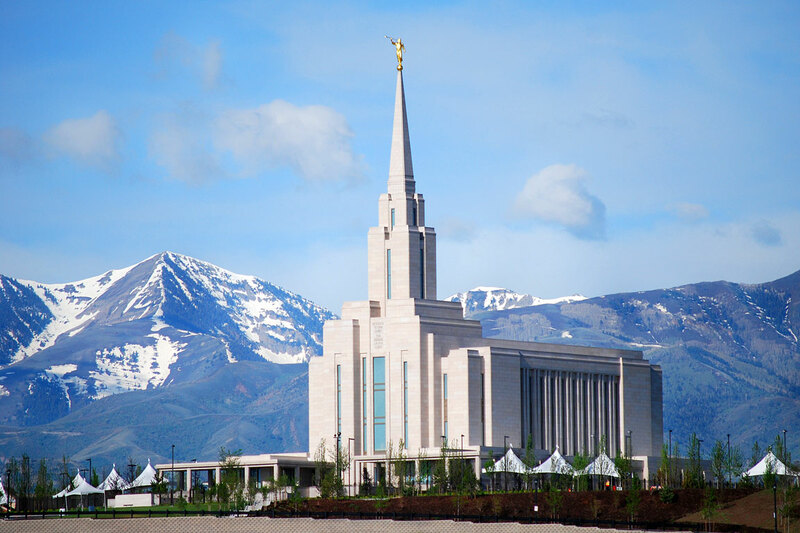 This particularity of temple design means that, in one real way, Latter-day Saint temples are bigger on the inside than they are on the outside. When we enter the doors of these magnificent temples, we leave behind all the ugliness and worry of the world. We encounter the beauty and peace of the temple. 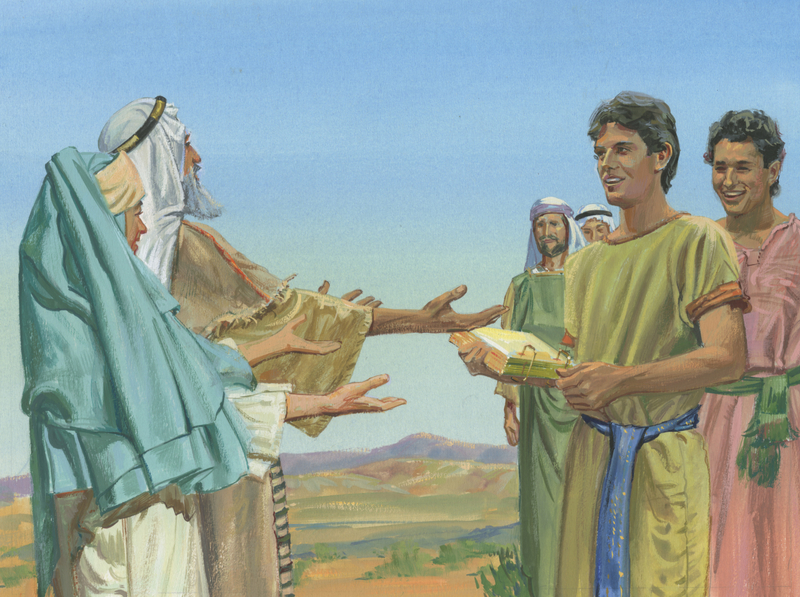 Outside the temple, there are so many duties, distractions, and difficulties that we cannot be fully ourselves—which in other language is called being “in the closet.” Only within the temple can we put aside the constraints of the world and be more closely reunited with our Parents in heaven. This is the sense in which the structure of the temple is an “inside-out” closet. Then, zooming out to a larger framework, we see also that mortality on earth is actually a closet experience itself! In the time between our pre-mortal existence and our resurrection, we are trapped within the limitations of mortality. We are apart from the presence of God. In the closet of this world, we can’t be all who we are intended to be. Our truest identity is as divine beings of eternal origin and infinite potential, but these identities cannot be fully expressed at this time. In time, we will each emerge from our chrysalis and become more manifest as the Offspring of God. The temple gives us a heavenly foretaste of that reality. It teaches us how to pass through the veil and come out of the closet of this world. Accordingly, by planting a little piece of God’s celestial dwelling-place here on earth, the temple is a blurring of the boundary between earth and heaven. It is an ambiguous space that defies categorization. Noting that earth and heaven are interqueered with each other is the only way of grasping the reality that when you are outside of the Temple, you feel inside a closet, but when you are in a temple, you are out of the closet. (Indeed, God has a peculiar way of reversing our expectations: “the last shall be first, and the first shall be last,” 1 Nephi 13:42. Compare Matthew 19:30, Luke 13:30, and also another interesting parallel, “For everyone who exalts himself will be humbled, but he who humbles himself will be exalted,” Luke 18:14). The temple is a refuge from the world’s closets in so many ways. This is seen in the symbols of equity-among-diversity within the temple. At first, the universal wearing of white clothing might not be seen to represent diversity. But it does. What we should remember is that the clothing does nothing to change the actual individual. All the people in the Temple exhibit the same diversity that they did in the outside world—the only difference is that they now are all treated equally. From the president of the church down to a new convert, and from the richest among us to the poorest, we all wear the same thing. This is precious. Furthermore, people of all genders attain a measure of equality not seen outside the temple. Even the living and the dead are treated equally in the temple, in that we ensure that no one is left out. This spirit of inclusiveness should never be forgotten as we labor in the world outside, fighting injustice and inequality. When we are in the temple, we should never forget all those who are suffering out in the world because they are not fully who they are intended to be, because they are trapped in the structures of homophobia, transphobia, racism, ableism, poverty, and so forth. Temples are needed as a refuge now, but that will not always be true. There are examples of several signs in this dispensation that will pass away. Prophesies, speaking in tongues, and knowledge will be set aside; so when what is perfect comes, the partial will be set aside. But love never ends (1 Corinthians 13:8–10). I sense that the temples are another example of the signs of this dispensation that will pass away. No refuge from the closet will be needed in heaven, because all of heaven is a refuge from the closet of mortality. Perhaps this is why John the Revelator reports in his vision the New Jerusalem, “And I saw no temple therein: for the Lord God Almighty and the Lamb are the temple of it” (Revelation 21:22). May our experience of freedom in the temple remind us to pray for the end of closets everywhere. is better than spending even a thousand elsewhere. than live in the tents of the wicked.” (Psalm 84:10). The verb translated “stand at the entrance” is סָפַף and is derived from the noun סַף (“threshold”), which we will encounter later. This verb could refer to serving as a doorkeeper at the temple, or it could perhaps relate the experience of a pilgrim concluding the beautiful Song of Ascents (Psalms 120–134) after journeying to the Jerusalem Temple. The temple courts referenced in the first half Psalm 84:10 are likewise an amazing place of ambiguity, as a person in the courtyard is not quite in the temple yet, but still on the temple grounds. Either way, the temple courts and the threshold of the temple are both transitional spaces. They are the ambiguous places that blur the boundaries between inside and outside, between special and normal. It is a queer place, if we understand “queer” as referring to whatever doesn’t fit neatly in one category or the other. Just a moment in either place feels more satisfying than eternity anywhere else. The doorway of the temple is also a place of both splendor and compassion. One of the temple gates is called “Beautiful” by the author of Acts. Perhaps it was named for its physical beauty, but it is also a focal point where grace is expected: “And a man disabled from birth was carried up and placed at the temple gate called ‘Beautiful’ every day so he could beg for alms from those going into the temple” (Acts 3:2). May we always remember the marvelous power and significance of the temple doorway. It is the only thing in the Bible that has “Beautiful” as its actual name (Acts 3:2, 10). Furthermore, the doorway to the Temple was a miraculous place in two separate visions recounted in the Hebrew Bible. Isaiah describes his experience: “They [the seraphim] called out to one another, ‘Holy, holy, holy is the Lord of Hosts! His splendor fills the entire earth!’ The sound of their voices shook the door frames [אַמּוֹת הַסִּפִּים], and the temple was filled with smoke” (Isaiah 6:3–4. See also 2 Nephi 16:3-4). Secondly, Ezekiel experiences two wild and marvelous visions while he was at the threshold (סַף) of the temple, where the glory of the Lord visits: “Then the glory of the LORD arose from the cherub and drifted to the threshold of the temple. The temple was saturated with the cloud while the temple court was filled with the brightness of the LORD’s glory” (Ezekiel 10:4. The second vision is recorded in Ezekiel 47:1). Indeed, the Lord chooses the threshold as a place of special miracles. 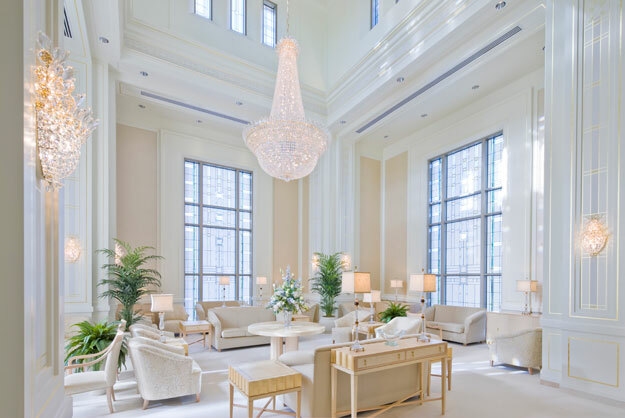 In modern LDS Temples, the entrance is the place where one sets aside the cares of the world. It is also a place of connection and unity, because it is the portal through which the people entering meet the people leaving. It is also the place where newly married couples greet those waiting outside. Even so, I plan to take some time to dwell and pray in the entry of the Temple, or the waiting room, and drink in the glory and profundity of encountering God in the mystery of a transitional space. Spending a moment in the doorway is better than anything else the world can offer (Psalm 84:10). Won’t you join me there sometime? If you search for the word “church” in the Book of Mormon (where it appears 194 times), you notice that the word is never used to identify a group of leaders. It always refers to the common people gathered around Christ. (The word for “church” in Greek, ἐκκλησία, is used of an assembly, gathering, or community.) This is also the understanding of “church” the Book of Mormon, whether in the plural or in the singular: (1) “Therefore they did assemble themselves together in different bodies, being called churches” (Mosiah 25:21). (2) The faithful converts who were baptized in the Waters of Mormon “were called the church of God, or the church of Christ, from that time forward” (Mosiah 18:17). Many Latter-day Saints are in the habit of saying “the Church says” or “the Church teaches,” but to me that oversimplifies an important gospel truth, the truth that we are the church. When many people say “church” they only mean leaders or publications associated with the church. However, the church is not a building in Salt Lake City. We should be cautious not to imagine it that way. We have never taught that human prophets are infallible or inerrant. No one is mistake-free except Jesus Christ, the real head of His church. Certain relative clauses throughout the text of Book of Mormon define the church to be the people: “I beheld that the church of the Lamb, who were the saints of God, were also upon all the face of the earth” (1 Nephi 14:12). Also, “I would speak unto you that are of the church, that are the peaceable followers of Christ, and that have obtained a sufficient hope by which ye can enter into the rest of the Lord, from this time henceforth until ye shall rest with him in heaven.” (Moroni 7:3). From the first book of the Book of Mormon to the last, this is its constant teaching. This is also the only way that I make sense of the “great and abominable church” of 1 Nephi 13, which cannot be identified with any tangible institution. Rather, the great and abominable church is an attitude, a direction, and a destination. This realization leads to a mature and profound understanding of what we mean when we say, “the Church is true”: the truth of the Church is its orientation, not its accomplishment. “The Church is true” symbolizes that we seek after truth, even though we don’t have it all. The reality that we don’t have all truth is taught firmly in the Ninth Article of Faith: “we believe that He will yet reveal many great and important things pertaining to the Kingdom of God.” The restoration of truth is not a past event. It’s ongoing: “Behold, ye are little children and ye cannot bear all things now; ye must grow in grace and in the knowledge of the truth.” (D&C 50:40, see also John 16:12). “We are willing to receive all truth, from whatever source it may come; for truth will stand, truth will endure.” (Joseph F. Smith, Gospel Doctrine, 1). “It is our duty and calling, as ministers of the same salvation and Gospel, to gather every item of truth and reject every error. Whether a truth be found with professed infidels, or with the Universalists, or the Church of Rome, or the Methodists, the Church of England, the Presbyterians, the Baptists, the Quakers, the Shakers, or any other of the various and numerous different sects and parties, all of whom have more or less truth, it is the business of the Elders of this Church (Jesus, their Elder Brother, being at their head) to gather up all the truths in the world pertaining to life and salvation, to the Gospel we preach, … to the sciences, and to philosophy, wherever it may be found in every nation, kindred, tongue, and people and bring it to Zion” (Discourses of Brigham Young, 248). This eclectic and curious attitude is why we pursue truth, not a church. You may be surprised to learn that The Church of Jesus Christ of Latter-day Saints does not have any converts! We are not converted to “the Church.” We are converted to Christ, and we simply walk with the church. Elder D. Todd Christofferson recently explained: “We do not strive for conversion to the Church but to Christ and His gospel, a conversion that is facilitated by the Church. 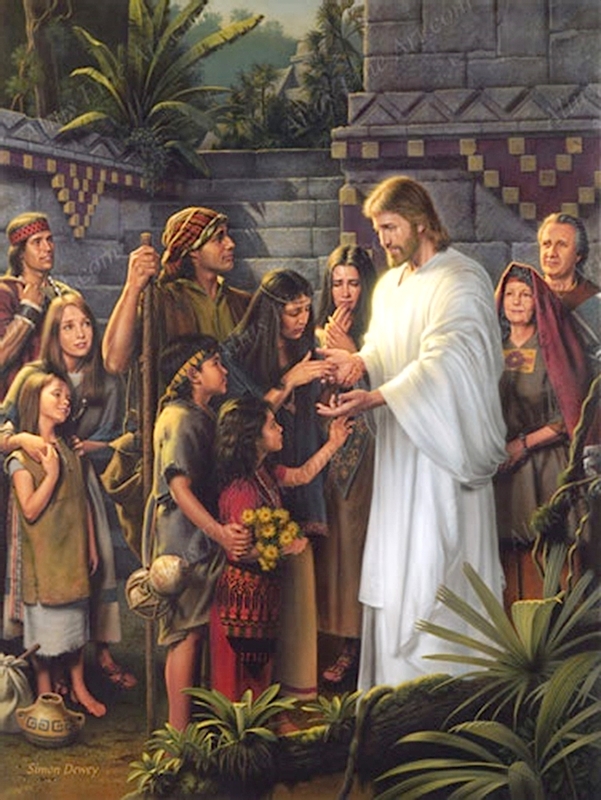 The Book of Mormon expresses it best when it says that the people ‘were converted unto the Lord, and were united unto the church of Christ.’ [3 Nephi 28:23]” (“Why the Church,” October 2015 Conference. See also Helaman 3:26). I have chosen to follow Christ and walk with the Church. Together, we will seek after truth, no matter where we may find it, and no matter who had it first. The “Church” is not a building in Salt Lake City; the church is the smiling faces of all the gentle people of my ward, who love one another and walk with me along our journey toward Christ, history’s only perfect prophet. And he is not only a prophet, but more than a prophet: the incarnate Son of God, fully divine, who is our Prophet, Priest, and King.